The company said it would unveil Alfresco Content Services for Lotus social collaboration software next week at IBM’s annual Lotusphere conference in Orlando. Quickr is team collaboration and content management software. IBM/Lotus already offers integration software called Lotus Quickr services for IBM FileNet that marry Quickr and IBM’s FileNet Content Manager. Kathleen Reidy, senior analyst with The 451 Group, says the Alfresco software gives users a lighter weight and easier to use option for ECM when compared to FileNet. “IBM can’t tell customers evaluating Lotus vs. [Microsoft] SharePoint that they need to use FileNet if they want ECM. That is what this Alfresco integration says to me,” she says. Alfresco executives said the REST architecture played a big role in the quick integration between the two platforms as did support for the Content Management Interoperability Services (CMIS) standard. 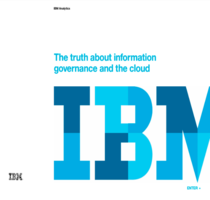 IBM officials called it a match made in CMIS heaven. “Lotus Quickr users can manage, store and retrieve documents, and kick off transformations and workflows through Alfresco without having to change anything on the front end,” says John Powell, president and CEO of Alfresco. He also says the multi-tenancy capabilities of Alfresco also make it easier to move ECM capabilities to the cloud. IBM/Lotus next week plans to expand on the Lotus cloud strategy it began detailing at the 2009 edition of Lotusphere. Alfresco also supports a host of other standards to help join the two platforms, especially from a developers perspective, including APIs, protocols and services such as Java, PHP, CIFS, XForms, SOAP, and .net. Lotus Quickr also inherits the 5015.2-certified records management capabilities included in the latest 3.2 release of Alfresco Enterprise that shipped this week. In addition, Alfresco Content Services for Lotus includes an implementation of the Microsoft SharePoint Protocol so company’s can switch from SharePoint to Quickr without having to worry about changing SharePoint clients on the front end. Alfresco says it plans to release the Lotus Quickr integration capabilities with both its Community Edition and Enterprise Edition. The Enterprise Edition, however, will include performance and management enhancements.